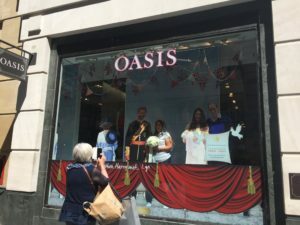 Celebrate the Royal Wedding – London style! 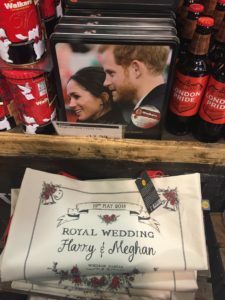 | Food Lovers Tours, Ltd.
From specialty “Harry & Megan” sushi boxes to Royal Wedding handbags, London is ready to celebrate this special union. 1: Do a Royal Stag Do – Prince Harry style! There’s nothing better than celebrating a wedding with yummy cocktails!! 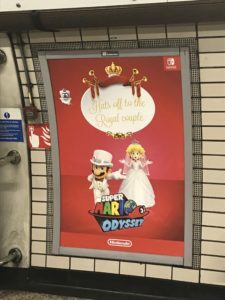 To celebrate the Royal Wedding, there are quite a few places in London that are rolling out the red carpet to celebrate the special day. 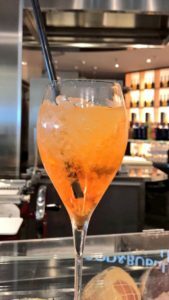 Here’s a fun list of Wedding Cocktails Venus that we think are absolutely worth trying! 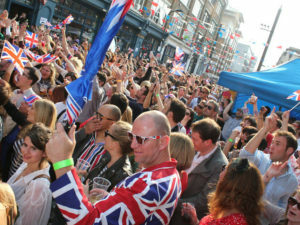 Celebrate the big day “East London-style” with Pimms, prosecco and drag queens at The Book Club in Shoreditch. The wedding will be screened while you play wedding bingo and other British party games. 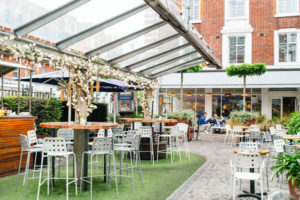 If you are looking for a unique experience on 19th May, check out the Bluebird Chelsea’s courtyard. 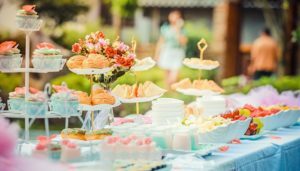 During the screening of the wedding, they will have a live DJ and food throughout the day – including a barbecue, strawberries and cream, and an all-day brunch. 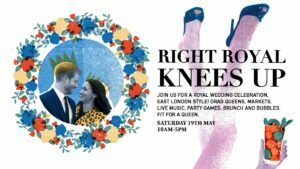 Southbank Centre’s having a “knees-up” in the form of a tea dance and party with music, dancing and songs, all on a royal theme. The Water Poet in Spitalfields hosts a wedding themed brunch, with cocktails including the Ginger Groom and the Blushing Bride. 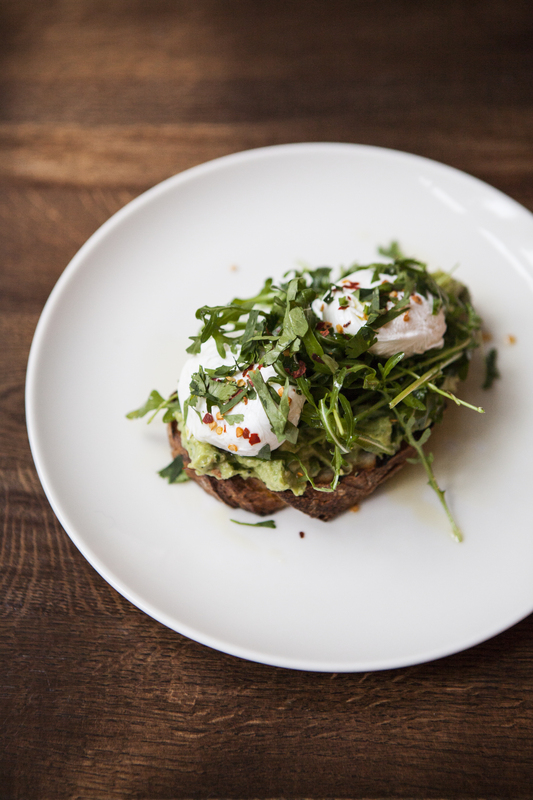 Get a brunch main, a dessert and a drink for £17, and watch the nuptials on the screens dotted around the pub. 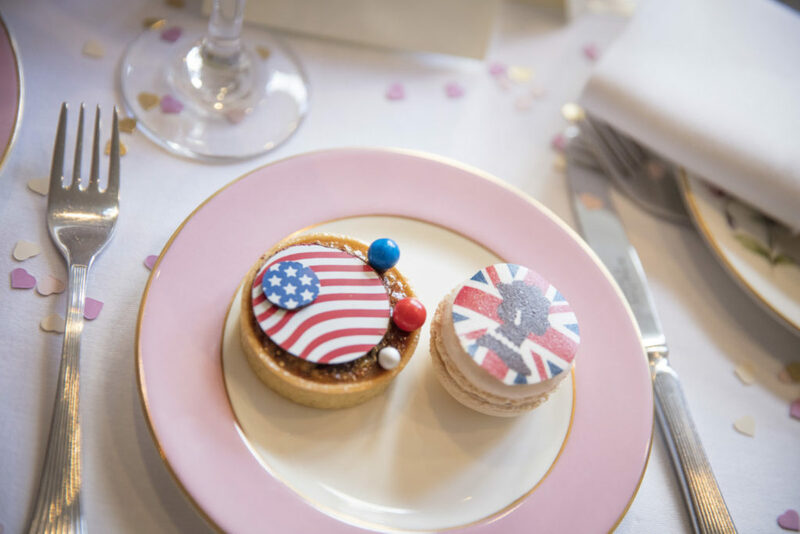 Considering the Queen opened up the Jubilee Tea Room to commemorate her Diamond Jubilee, what better place to celebrate the Royal Wedding than here! Tuck into a one-day only Right Royal Celebration Afternoon Tea with champagne, scones and cakes while watching live coverage of the ceremony. 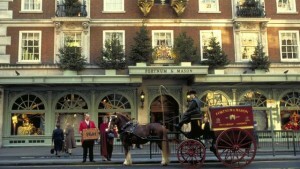 Private members’ club, Devonshire Club, is celebrating the Royal Wedding with a form of a Royal Wedding Garden Party. Open to members and non-members alike, you can watch the build-up to the wedding from 11am, then tuck into afternoon tea in the Garden Room at 12pm when the wedding begins. 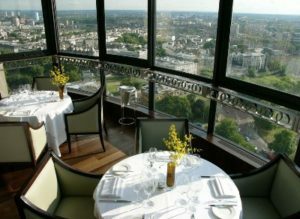 A fancy restaurant with an excellent view, Galvin At Windows, is holding a special lunch menu for one day only, accompanied by a screening of the wedding. Tuck into a three course menu designed by head chef Joo Won, preceded by an English sparkling wine reception. 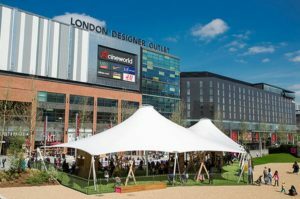 London Designer Outlet, in Wembley, is putting up a huge screen to air the Royal Wedding show. 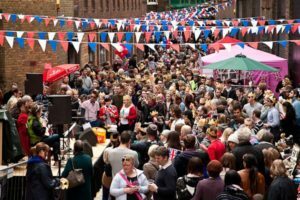 Deckchairs will be provided (get there in plenty of time to get one) and the Outlet has more than 20 bars, restaurants and cafes where you can stock up on refreshments. 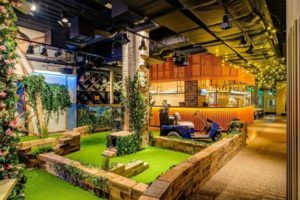 The crazy golf course that’s taken over the old BHS on Oxford Street, Swingers West End, will be screening the Royal Wedding, allowing you to watch as you tee off. 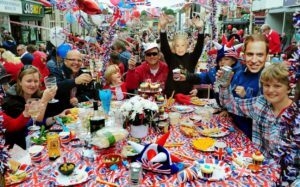 Bunting and themed props will be on hand for those who like a photo opportunity, and special cocktails will be available on the day, including Make Your Markle and The Royal Cup. Radio Rooftop is hosting a special regal-themed brunch with a Brit Vs. Yank theme — think cod and chips meets pancakes. Enjoy your themed brunch while you watch the Royal Wedding — although most people find the skyline views might be distracting from the show. 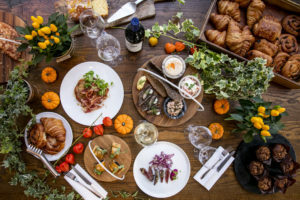 Watch the wedding as you tuck into brunch at Aster, a restaurant located not far from Buckingham Palace. Their menu features six cocktails designed specially for the wedding, including the Markle Sparkle and the Botswana Sunrise. Skylight, the rooftop at Tobacco Dock, is back this year with bars, street food, and activities such as pentanque. 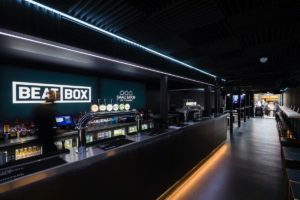 On wedding day, the proceedings will be screened up there on the roof, so you can kick back and watch while tucking into the food and drink on offer. 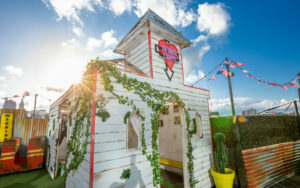 Take to the roof at Queen of Hoxton, get dressed up in your finest wedding gear (free shot if you’re in a wedding dress) and party the afternoon away in the chapel which is popping up for the day. Drag King Elvis will be presiding over a mass wedding ceremony (a fake one… we think). This year, the free flower festival is taking over Chelsea’s streets for a royal-wedding-meets-summer-of-love theme. This Saturday will be filled with all sorts of celebrations and cheer. No matter HOW or WHERE you celebrate the Royal Wedding, there’s no doubt that you will find an amazing place to lift a glass and salute the royal couple! 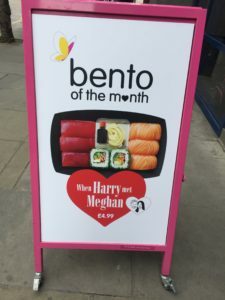 Congratulations, Harry and Meghan, from London Food Lovers!! This entry was posted in blog, Local Hotspots for Food Lovers, Our Recommendations. Bookmark the permalink.